We humans love to anthropomorphize other species. Anthropomorphism is defined as the “attribution of human traits, emotions, and intentions to non-human entities and is considered to be an innate tendency of human psychology” (Oxford Dictionary, 1885). It’s one of the first ways we try to relate to and connect with them. Pet owners can relate to pets by attributing certain human characteristics to their pure-bred German Shepard puppies and dogs. We try interpreting their facial expressions, wagging tail and body positioning to understand what they want and need. We base these interpretations on our own emotions and body language and give animals what we think they need or deserve in terms of human concepts of right and wrong. 61 percent of women tell their dog about their problems. 31 percent of women feel their dog is a better listener than their partner. 24 percent of men use their dog to talk to a good-looking stranger in the park. 14 percent of men say their dog showed them more affection than their loved ones. In addition to having deep, meaningful conversations with our dogs we also spend a fortune on them! The American Pet Products Manufacturers Association estimates that American pet owners spent more than $41 billion dollars in 2008 including pet massages, manicures, seats on specially chartered jets, school/daycare, designer jewelry etc. Most dog trainers advise that viewing dogs as four-legged humans is ill-advised because it means treating them as if they’re a different species than what they really are and expecting them to think and act the way humans do. We have successfully domesticated the dog, but we will never be able to de-animalize a dog and remove their natural instincts. 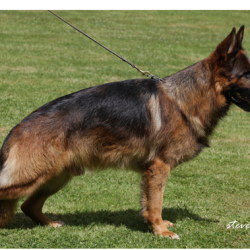 When GSD owners try to change a dog into having human characteristics it almost always results in behavior problems. Dogs do not live in the past or the future, as humans do. Instead they live in the moment. By not satisfying a dog’s natural instincts we create confused and unhappy dogs. Examples: Allowing a cute little furry “baby” to growl at an approaching person is laughed off as cute rather than as a serious issue. Lap dogs treated like babies may bite because it is uncomfortable. When your dog urinates or tears up a pillow in the house while you’re gone it isn’t for revenge. Dogs don’t seek revenge. They don’t pee on your bed because you left them alone all day. Your dog didn’t chew, urinate and poop on your favorite shoe because you yelled at her earlier. Dogs aren’t spiteful. Attaching a human reason for this dog’s behavior may lead to ineffective training. The dog is most likely stressed, has separation anxiety or is not properly trained. If we try to understand the true root cause of behaviors from the dog’s perspective, it can make training our dogs much easier. 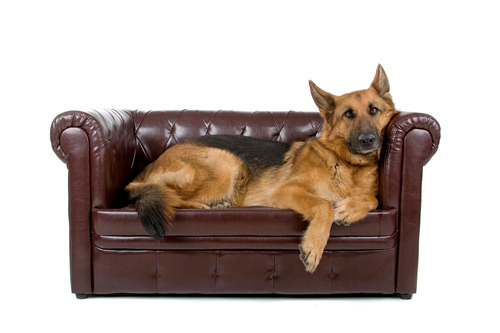 Examples: Allowing your German Shepherd dog to nudge you for pats or treats, shove a toy at you to demand play, bark unceasingly to come in or guard food from you are problem behavior that is often dismissed as a dog that wears the pants in the family or is in charge. When you allow this bad behavior you are rewarding your dog for it because he gets what he demands if he is pushy enough. 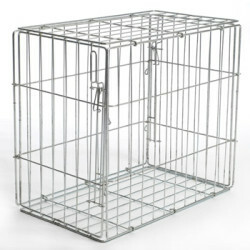 That can cause serious problems outside of the house when your dog shoves other dogs around or ignores social signals. Your dog may get into fights with a dog that refuses to accept such rudeness, and a dog that is used to getting his own way may bite someone who doesn’t obey his demands. Examples: Letting strangers pet your dog when your dog is uncomfortable with it because you don’t want to be rude; pushing a dog to interact with others because you think the dog needs to socialize or forcing your dog to stay in a busy public place or a room with playful children may push your dog beyond their comfort limits for the sake of human social norms. If you ignore how the dog interprets or is responding to what’s happening and force your dog into an uncomfortable social situation the dog may react by standing up for himself. The first warning signs are walking away, avoiding eye contact, licking his lips, ducking his head or even growling. The next step could be biting. You need to advocate for your dog by not letting people pet your dog, not letting children play with your dog because you are in control over these situations. Examples: You get your dog all excited for a walk because it’s really cute when he jumps and twirls because we think that equates to being happy. However overly excited dogs have trouble staying focused and controlling impulses and can have increased stress levels. It may result in your GSD barking at other dogs or yanking at the leash no matter how often you pull back on the leash or say, “No!” This is because your dog’s excitement reached levels that made it harder for both of you to enjoy the walk. Encouraging calm behavior over exuberance can make your dog a happier, less stressed companion. The truth of the old saying “treat a dog like a human, he /she will treat you like a dog” has been demonstrated again and again. Instead of treating dogs like furry babies we need to demonstrate how much we love, appreciate and respect them by remembering they’re dogs, keeping anthropomorphism in check and providing a life for them that appreciates your dog for its dogness. All dogs need daily exercise, play time with dog friends, healthy food, toys and chew to play with, obedience training, and attention from their owner. Being a great dog/pet owner is about meeting your dog’s needs first and then your own. 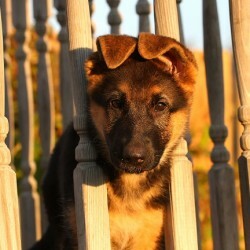 Why Crate Train Your Imported German Shepherd (GSD) Puppy? 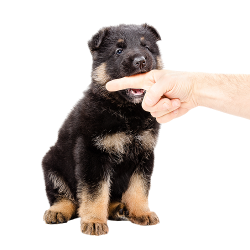 How do I stop my purebred German Shepard puppy (GSD) from biting ?